Home / Giveaways / GYCT Spring Dress Tour Firecracker Girls Dress and Giveaway! 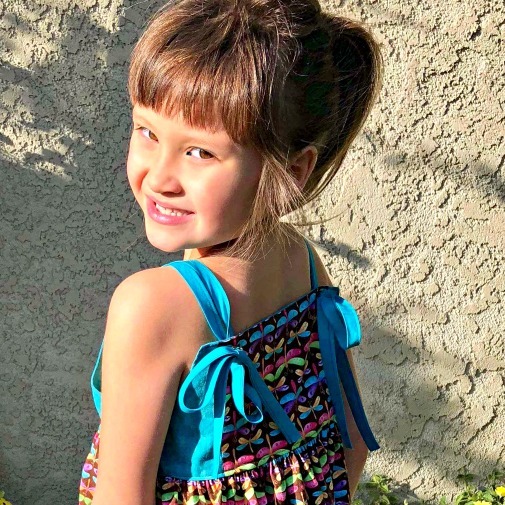 GYCT Spring Dress Tour Firecracker Girls Dress and Giveaway! I made the amazing Firecracker Dress and I see quite a few in my future. It is a great dress to use for color blocking or to even make in all one fabric! Coupon code: 15% off with code “SPRINGTOUR” The designer is a wife, mother and former Family and Consumer Science Teacher (aka Home Economics). She loved to sew and found that she loved designing as well. The simple lines and great instructions really make her patterns stand out from the rest. As you can see Destini loves to wear these cowboy boots. I mean like every day she wears these boots. It was important to find a fabric that matched them and I was so glad to find the dragon flies on a brown base. The colors all went together so well. Making the straps/ties was an easy task as well you can simply use your fabric to make straps or use packaged bias tape like I did. Really easy and a great result! The Firecracker Dress and Tunic is the perfect outfit for hot weather. With double straps that pull over the shoulders and tie in a bow and a gathered skirt for more fullness and fun. Add a top underneath for more coverage during cooler weather and pair the tunic with your favorite leggings or shorts. A great pattern for adventurous beginner. Includes step-by-step instructions, full color photos, and full size pattern pieces. Comes with pattern pieces for sizes 3 month, 6 month, 12-24 month, 2, 3, 4, 5, 6, 7, 8, 10, and 12. You can use the code for any of the patterns available at GYCT Designs and try your hand at the awesome things available. LOVE the dragonflies!! What a sweet dress, to go with her favorite boots!